Senior Citizens are Getting "Wired"
It’s not uncommon to see everyone from toddlers to teens to Baby Boomers glued to their mobile devices. With the growing popularity of tablets, smartphones, and laptops that transform into tablets more people are staying connected via the internet. For a generation that may have once lived without a telephone in the home, or were used to using party lines, the idea of accessing an endless amount of information or being able to send a note to someone instantly – all from a phone – can be an overwhelming thought. However, more and more senior citizens are getting “wired,” or more simply stated: seniors are taking advantage of technology! A recent article on Fusion.net highlighted campaigns by DoSomething.org and MentorUp that seek to help seniors learn skills to use technology and interact with those around them via social media like Twitter and Facebook. While these campaigns aim to get seniors connected socially on the internet, technological skills can also help seniors stay connected when it comes to their own care, or the care of a loved one through home care software or a home care system, like ClearCare Online. For seniors who require a little additional assistance to live independently in their homes can benefit greatly from the assistance of an in-home care agency. 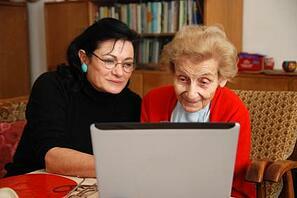 The best agencies use a home care software or home care system, such as ClearCare Online, to manage their care. What does this mean? With the power of a home care software, agency administrators can use the technology of a home care system to easily manage their client and caregiver list, schedule shifts for clients and provide real time updates to clients and their loved ones. Seniors who are even a little tech savvy can benefit from a home care software or home care system, like ClearCare Online, by being able to access an area that ClearCare Online refers to as the “Family Room.” In this secure area, seniors or their designated loved ones can log into the home care system and see upcoming shifts, records of past shifts or invoices for services rendered. This allows seniors to closely monitor their care via the home care system and ensure that they’re working with an agency committed to transparency in care. Whether seniors are hopping online to send a tweet out their followers, or logging into a home care software to check on their upcoming home care schedule, connecting seniors with technology can open a whole new world.